Look no further! Ideal location for an overnight stop or long term stay. Pull-thru sites with full hook up & 50 amp service. Cable TV, WiFi, heated pool, game room, pet-friendly and pavilion to entertain. Big Rigs Welcome! We only stayed one night, but the registration was easy, our site was reserved and held, super clean restrooms and bathroom facilities/showers, very spacious site with full hook ups where they need to be. Would highly recommend this campground. We really enjoyed after hours check in ease and over all convenience. The staff was friendly and helpful and the main building including restrooms was clean. The campground is a worn out KOA which had an outdoor kitchen area that was probably nice 20 years ago. It's close to I-65, however unless you enjoy the sounds of trains rolling by throughout the night sounding their horns and emergency sirens on the nearby roads, look elsewhere. good RV park, my site was perfectly level, reservations and check-in was very easy. camp store is well equipped and clean. I did not use restroom or shower. led street lights provide reasonably night time visibility. hook ups were good concrete picnic table pad and walkway on door side of coach was unique, help us to keep entry into coach clean. will stay again when traveling in this direction. I don't understand these negative reviews. This rv park is awesome. Beautiful Shaded sites with concrete pads. Showers & bathrooms super clean. Gorgeous Pool. Nice store also has basic rv supplies. Tv & internet reception excell. Staff very friendly. I wanted to live here. My family and I had a wonderful stay! The grounds are very well kept and the staff are very friendly and helpful. I would definitely recommend this RV park and will hopefully stay again soon. The sites are not concrete but the picnic tables and your steps leading out your Class A RV are on a concrete pad which is the second best type of site. The staff was great as I wanted a site to be able to get my satellite dish a signal and they did just that. We will stay here again. We stayed at Birmingham South RV Park 2 nights. Let's just say we will not stay there again. The staff was rude and very unfriendly. The campground was clean however, we asked about a campfire and we were told we had to bring our own fire ring. After we unhooked our truck was slightly in the grass, were told unable to be in grass due to it being difficult to grow, but a seasonal person right next to us had their 2nd vehicle in the grass. Campers are also only able to pull into the site one way due to the concrete slabs, and if you do not have at least a 30' sewage hose you can not align the slab and septic. Just a very unfriendly environment, does not feel like a family friendly campground. We will not pay to stay there again. Very nice. clean and quiet. level sites, good spacing between sites. would stay again. The site has a picnic table and large area of grass the laundry room was clean the morning staff was nice. Our second stay. 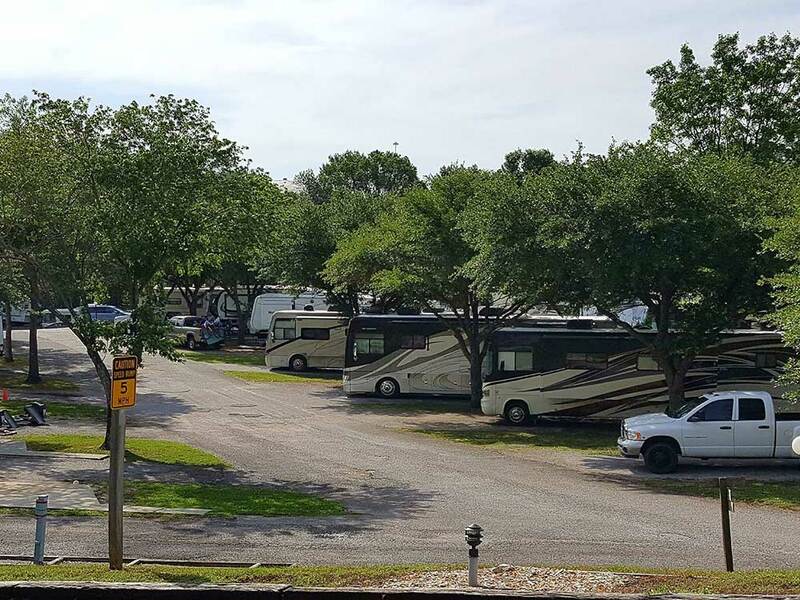 Several long term campers on the perimeter of the park. Restrooms are clean and under some sort of renovation. Separate mens and ladies restrooms, separate showers rooms. Plenty of hot water. Did not use laundry facilities. Most of the improvements are cosmetic. Evidence of problems with the structure of some of the buildings. Roads in fair condition, sites in sections of the park very unlevel.Few other campground choices in area and this seems to be the best based on other reviews. Good Sam rating seems quite inflated. Will probably not return. We had a very bad experience at the Birmingham South RV Park. Trains went by ALL night long sounding their horns. In the morning our new electric jack would not work. So we could not hook up our truck to our travel trailer. We asked the office to borrow some tools. Were told they had none. Asked a Maintaince man on site, was told the same thing ! Very unfriendly ! Total opposite of most RV campgrounds. No would working there seemed to care at all . Had to call a tow truck . To help us get our trailer hooked up. Do not stay here . Keep on the interstate to another more helpful and caring RV campground. We have stayed at many wonderful RV campgrounds. This was by far the worst ! Nice place to stop over. Older park, nice staff, well stocked store. This is our usual stop over. This campground is very convenient for access to Interstate 65. The park has pull thru sites that work great for us to stay hooked up. We have a 41 foot 5th wheel and find the roads are wide enough to maneuver our RV. We have stayed here several times when traveling thru Birmingham. I recognized some of the RVs that have been here each time we come, so I assume some of the campers are long term. The restrooms are clean. While the campground is a little bit older, it has been maintained well. I do recommend this place and will return here, when in the area again. My husband & I went on our first cruise America RV trip starting in the Chicago driving down to Florida and by far this was the best campground we've stayed at. We have been camping for past 12 years and have never showered at an RV park without flip-flops but this location was so clean we felt comfortable not having to use them - it was like being at home. We also had a great Mexican dinner within a 5 minute drive at Cozumel. Driving from NW Arkansas arrived at campground 11:45 AM. Was told no check in until 12 Noon, to go park at Home Depot until Check in time. Site we were later assigned was already empty. Spent night and left early early morning. Staff unfriendly! Would not recommend this Campground! Another campground that looks like it used to be a KOA. Easy to get to. However when we arrived at 5:30, we found that the office had already closed...very unusual for a campground that likely gets one-nighters coming off the freeway. There was a posted list of available sites. It was confusing because one of the sites had a traffic cone in it. Another one had a pile of gravel & a large backhoe sitting on it. Finally found a site in the back that we could fit on, but we could only run one AC since it was 30amp. Roads through the campground were rough & there was street noise. Would not recommend. Super quiet and clean restrooms. When we arrived for our Saturday night stay, it was after hours but our paperwork was ready for us. The pool was warm inviting. We enjoyed our stay! I am a solo traveler, and always attempt to stay at this campsite when traveling toward Florida. They are welcoming with a nicely stocked camp store. We have stayed here twice previously. Stayed on the other side, behind office and pool. Way nicer. This time lots so unlevel I almost fell several times stepping off RV step. Area surrounding was a mown patch of weeds and stickers. We were in shade but many spots are not and that would be unpleasant. At time of reservation, we asked for late checkout as my husband had a 10am doctor appointment downtown in heavily congested area. At that time were told they didn't usually allow late checkouts but she would get back to me. Never heard so morning of Check out I walked to office, a rude woman shook her head no from the moment I mentioned late checkout, as I mentioned this had been requested ample time back, I dropped the cancer card, I mentioned the 18 empty places I had counted as I walked over (actually counted 35 places as we pulled out), assured her we would be back before check-in time. All this time she rhythmically shakes her head. I finish. She says, " No late checkouts. Rules are rules." I would stay in the dark in a Wal-Mart parking lot before I returned there. Stayed here overnight on a trip from Florida to Idaho. Staff is friendly. There is some time of pipeline right behind the park that emits a noise all night and trains pass by the park. Very near I-65 which makes this the perfect park to overnight. We did not use the restrooms, so I can't comment on those. Campsites are very poorly leveled. Sewer hookups are uphill, beyond what can reasonably be dealt with. Pull throughs are not configured for travel trailers. You can expect to have to drop your trailer on the front of pad and park tow vehicle behind them. Staff was totally unresponsive in helping me move to another site. Park does have nice amenities, but you'll probably be too upset with your site to enjoy them. Very easy in and out from I-65. Sites were pull-thru and level with 50 amp service and full hookups. Staff was friendly and helpful. We stayed overnight and would stay here again. Wi-Fi and Cable were so-so. We have stayed here multiple times over the years as an overnight layover between Nashville and the coast and have always had excellent experiences. The people have always been friendly and the facilities more than adequate. The pool and bathrooms are clean and well maintained. The place is not new and could use a little repaving but is more than sufficient for our purposes. we will use them again next year. Park is conveniently located and staff was friendly when we checked in. Area we were parked in appears to be the older part of the park and it needs a lot of work. The pads are broken, sites are very uneven, the roads are in need of repair and trees block TV reception. WIFI is basically non existent. There are a number of unkempt long term units that have junk stored outside all around them. Dog park area is well fenced but small, no grass and dog poop was not picked up. They charged extra for 50 AMP service. All in all the park is much need of tender loving care. Roads within park are rutted and rough, electrical service on our site was showing a voltage drop on power monitor, WiFi service is spotty at best. Main facilities I.e. pool, restrooms and playground are maintained, however, RV sites and hook ups are not. Staff is friendly and helpful, Park just needs a serious amount of money to remedy deferred maintenance issues. Sites are tight. Big rigs with tows are sticking out in road. Look like an old KOA. Was very full due to proximity to I-65. Roads need paving and sites need gravel. Utilities, including cable, work well. Helpful staff. Not a destination park but fine for over night if you can fit in. Booked for 2 nights while in Birmingham on business. When I checked in I paid for two nights as is customary. After settling in to our site, we were advised that one of the power stands on our row had "burn up" and that power would be off for up to 5 hours starting at 9:00 am. I questioned why we were on that row but was told we would be ok. The next day we were told to unplug at 9 as that was when the electrician was supposed to come but they weren't sure. I decided I did not want to stay the second day as my wife is sitting there with no power. I went to the office to cancel the second night and was told they could not refund my money. All they could do was a rain check. I told them I would not be back and I was on company business and insisted on a refund. I asked to speak to the owner only to be told she was on vacation and not taking calls. I told the manager I wanted the credit issued to my card but she finally gave me cash back. As I was leaving the office I heard her tell someone to put me on some type of list. I thought about this and went back to inquire and was told I was banned from ever staying there again. First, I would camp at every Walmart in america before I would even consider coming back to this less than stellar park. Secondly, I told her to put my name down twice just to make sure. I now have to question Good Sam's rating because there is nothing that warrants this place to be over a 5. Good luck if you stay there. Easy to find RV park off I-65. Asphalt roads and coach pads with some erosion alongside the pull through. Just wide enough for a class A. Nice attractive trees in most of the park for those that are longer stays. No complaints unless you hate trains. Whistles all night long. I would stay here again. Nice campground...super clean restrooms, always well supplied. Stayed there going down to Florida and on our way back home... will return next year. Only stayed one night but was impressed with restroom/shower facility. Very clean and warm (considering how cold the weather was). Staff was very friendly and helpful and location offered easy in and out. Will stay again. We stayed one night on our way through the area. Much of the park had big trees, but our spot on the end of the row at the front had no shade. The staff was very friendly and helpful. The showerhouse was clean and the showers were in little individual rooms. They had a large store, the usual souvenirs, sundries, etc, but an additional large area of RV accessories and maintenance items. The access from I-65 was easy, but there was a lot of highway noise, sirens, and trains rumbling and whistling all through the night. There was a pool, although we did not have time to use it. It was a good overnight stop. Good location near to I65. Access to many services. Campground a little frayed around the edges. Roadways starting to crumble. Site had concrete pad for table but area around concrete had eroded so pad was sticking up considerably. Real tripping hazard. Wifi ok but they no longer offer cable. Because of location they were mostly full.